I had to write this Raceoption review after many followers of mine asked me. I tried to be as objective as possible. You can read the main traders’ complaints later on this post. I express my opinion in this post. You may draw your own conclusions. RaceOption is a binary options broker established in 2017. They are a trading name for Financial Group Corp. However, RaceOption has not been the best broker, with a string of mixed reviews on their name. As a matter of fact, the first red flag is the absence of a real, land-based office in any country (except Vanuatu). Therefore, their business is entirely conducted online. On their website, they indicate that they are regulated. However, they don’t say which regulatory body regulates them. Another red flag? Well, I did my due diligence, only to find that they are not regulated by any top players, like CySEC and FTA. This is the main reason I decided to write this Raceoption review. The same reason I made my Binarycent review. 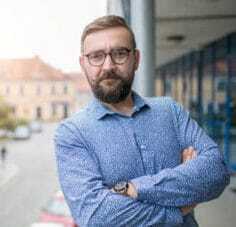 You can visit here my guide of the best regulated binary options brokers. 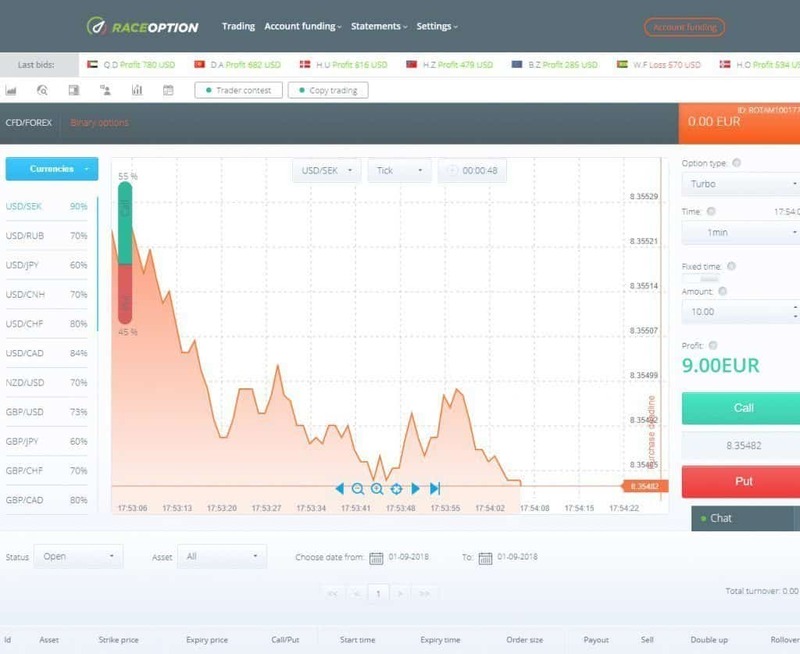 RaceOption offers an in-house trading platform. 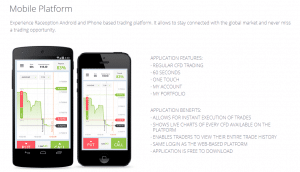 The trading platform is completely web-based, and no additional download is necessary. The trading platform has a modest arrangement that makes trading and navigation simple. However, the trading platform is not the best. Trades are not executed fast enough. Plus, the price quotes are somehow different from the ones from Thompson Reuters. And that’s where they purport to get their quotes from! Their assets catalogue is well-populated with a wide array of assets. At RaceOption, I could trade on currencies, stock indices, stocks, and commodities. They also offer a number CFDs. The assets available can be traded with options such as 60 seconds, call/put, ladder, and touch options. To add to that, they allow diverse expiry times: short-term, long-term, and medium-term. The minimum trade that you can place at RaceOption is $1. In addition, their payouts are average compared to other brokers. In-the-money outcomes can attract payouts as low as 60% and sometimes as high as 80%. Lets continue with the Raceoption review. I tried to find any mobile app on the official stores but no app anywhere! You will get a promo code popup after you submit the registration form. Here is the raceoption registration page. Since there is no regulation all traders can register from any country in the world. 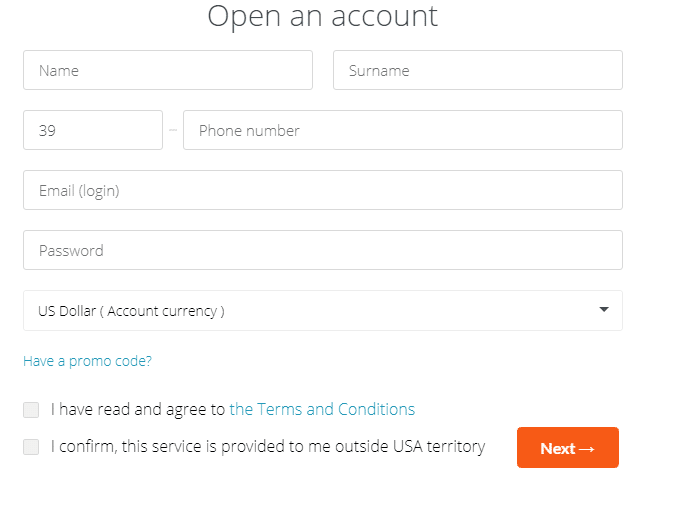 However, on the registration page you have to check “I confirm, this service is provided to me outside USA territory”. 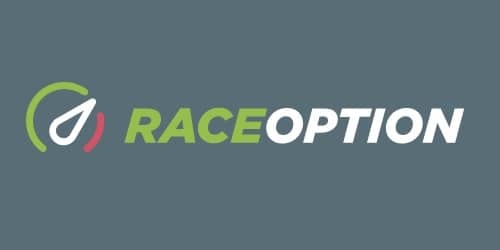 In terms of banking, RaceOption is definitely among the best brokers. They gave me many options to make my first deposit. They include credit/debit card, wire transfer, Ethereum, Altcoin, Litecoin, Perfect Money, NETELLER, and Skrill. Deposits are processed fairly fast, and they attract bonuses depending on the amount deposited. Unfortunately, making a withdrawal is so bureaucratic that it is simply unattainable. At sign-up, they clearly state that all withdrawals are processed in an hour. However, that’s not the case. It can take up to a week or forever for a withdrawal request to be accepted or denied, which is unacceptable. Apart from standard conversion fees, RaceOption does not levy any hidden fees on trading positions. At RaceOption, you can sharpen your trading skills with their demo account. However, to use the demo account, you have to be a member of any account type. In that, you have to commit financially to enjoy demo trading. The only upside of the demo account is the fact that you can replenish trading credits when depleted. A Google search returns hundreds of results that poke holes in RaceOption’s credibility. To tell the truth, gauging from my experience, RaceOption is not that good of a broker. Here are some of the complaints I got from the web. Most of the complaints available online are on RaceOption’s complicated withdrawals. That is part of the modus operandi of most financial scam brokers. Here is a complaint from a real trader. “I read other reviews and it seemed positive so I decided to invest in it. When I asked to withdraw my money, I got an email from their finance department refusing to give me my funds. This has got to hurt!! This broker is not one of my favorites. You can click here for the list of the best binary options brokers. Going by my experience at RaceOption, I can safely conclude that they are not great. The fact that they are an exact replica of the Finrally brokerage website speaks volumes. I can only urge you to stay away from the broker if you love your money. However, if you are one of those “experience is the best teacher” traders, you can try and see how it ends. Feel free to share your thoughts on this broker. This was my review of the Raceoption broker. Leave your reviews above and your comments below!